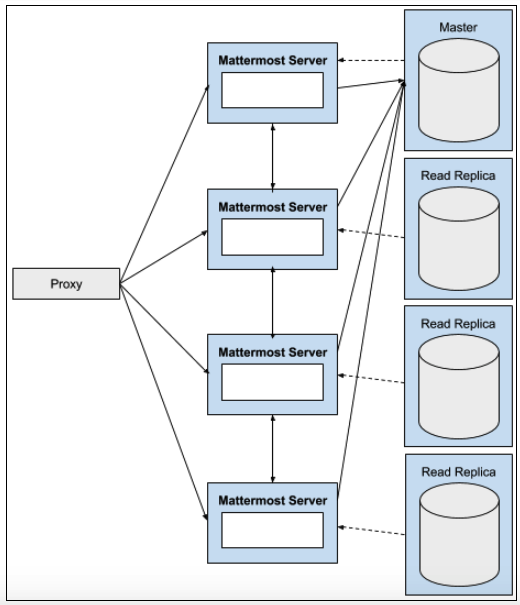 This page provides an overview of the Mattermost architecture with reference architecture. For a more detailed deployment overview, check out our deployment wiki. Authentication client, which provides the functionality for users to log into Mattermost via email address and password in Team Edition. Enterprise E10 adds the ability for users to authenticate using Active Directory or LDAP, and Enterprise E20 adds the ability to authenticate using SAML SSO providers like ADFS, OneLogin and Okta. Authentication provider, which enables the Mattermost server to authenticate to other services like GitLab and Zapier using OAuth 2.0. Notification service, which sends notifications via SMTP or a Push Notification Service for mobile applications. Data management service, which connects to supported databases and file storage solutions (local, network-attached storage, Amazon S3, etc), and manages the reading and writing of data to and from them. The binary talks to a database, typically MySQL or PostgreSQL, and a filestore. 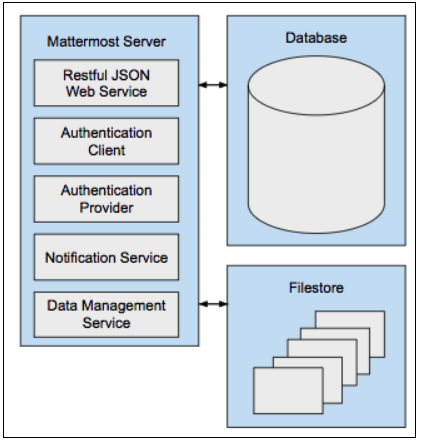 The Mattermost hosted push notification service can be used to send push notifications to mobile clients. Team Edition users can deploy the service using the Mattermost test push notification service or deploy their own push notification service and compile their mobile applications to use that service. Security: A proxy server can manage Secure Socket Layer (TLS/SSL) encryption and set policy on how network traffic will be routed to the Mattermost server. Performance: In a high availability configuration, the proxy server balances the network load across multiple Mattermost servers for optimized performance. A hardware proxy with dedicated devices for processing SSL encryption and decryption can also be used to increase performance. Monitoring: A proxy server can monitor connection traffic and record traffic in standard audit logs that common monitoring tools like Kibana and Splunk can consume and report on. Some of the events that can be captured include file uploads and downloads, which are not tracked by the Mattermost Server logging process. 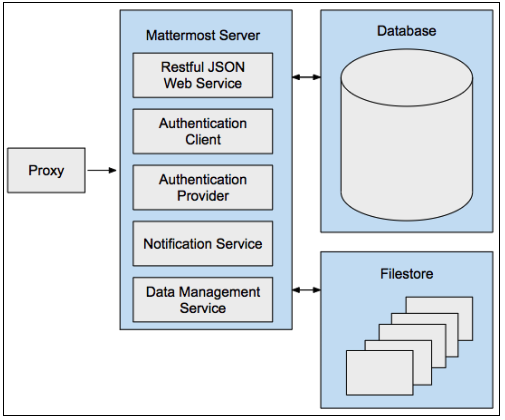 Mattermost provides documentation and support for the NGINX proxy. For informaton on how to install and configure NGINX for your environment, see our guide. Mattermost also unofficially supports other proxies including Apache 2. There are also communication protocols (HTTPS and WS) that define the type of connection the user makes with the Mattermost server. 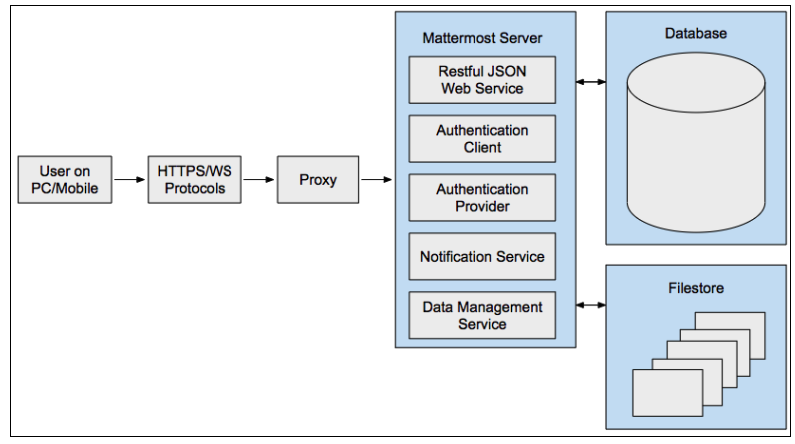 HTTPS connections to the Mattermost Server render pages and provide access to core platform functionality, but do not include real-time interactivity (which is enabled by WSS connections). HTTPS is a secure, encrypted protocol and is highly recommended for production. Unencrypted HTTP connections may be used in initial testing and configuration, but should never be used in a production environment. Secure WebSocket (WSS) connections to the Mattermost Server enable real-time updates and notifications between clients and the server. If a WSS connection is not available and HTTPS is substituted, the system will appear to work but real time updates and notifications will not. In this mode of operation, updates will only appear on a page refresh. WSS has a persistent connection to the Mattermost Server when a client is connected, while HTTPS has an intermittent connection and only connects to the server when a page or file is requested. They can also be used to handle scale and failure handoffs in disaster recovery scenarios. Moreover, search replicas are also supported to handle search queries.